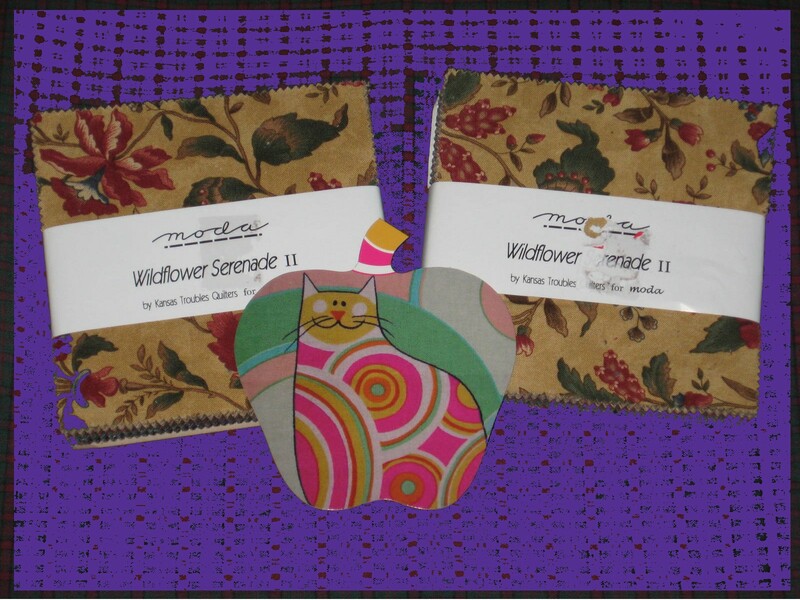 A while A year ago I treated myself to a couple of packs of Moda Wildflower Serenade charm squares from Thumpacat Fabrics in New Zealand. It was a complete impulse buy (regular readers will be seeing a theme here) and I was stumped by what to do with them. I posted a call for suggestions on the Quilting Board but didn’t get any more specific recommendations than to go to the Moda Bakeshop. I had first thought about making hourglass blocks, stacked on each other in long columns. 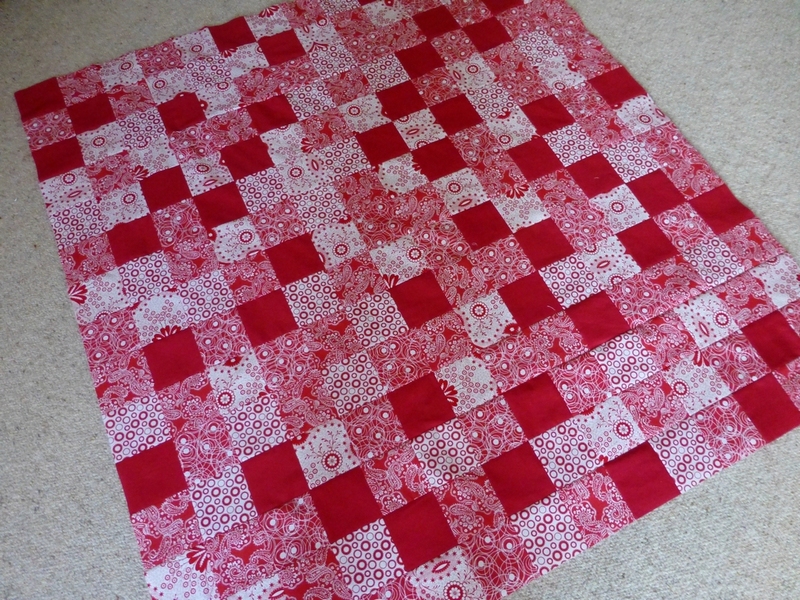 Later I dismissed that idea and strung the charm squares together loosely based on the instructions for the Stacked Coins Baby Quilt, most of which I cheerfully ignored. I was able to make a start in between family visits on Christmas Day, thanks to the fact that our family celebrates with a festive meal and gift giving on Christmas Eve, following the European tradition. There was a long hiatus after Christmas when we got busy with garden work (harvesting potatoes), painting our front fence and sailing. The sailing is a whole other blog post, as we received some very colourful abuse for having a sail boat at the boat ramp. The abuse was meted out by a lady woman who clearly thought we had a lesser right than the motor boats to use the very crowded boat ramp. I was particularly un-impressed as the profanities were dealt out in the presence of some very tender young ears. As this is a quilting blog and not a blog on modern etiquette I’ll leave it at that. To make the top I matched light to dark squares and sewed a seam along parallel raw edges. Then I cut each square in half down the middle and opened them up to made one light and one dark ‘coin’. Next, I sewed 30 coins end to end in a long stack and put sashing of 4 1/2 inches between each stack of coins. I have put the border on and worked out how I can piece a backing together but I’m not happy with the direction this quilt has taken. The proportions don’t seem right to me (it’s 43 inches wide and 62 inches long.) The Wildfower Serenade fabric isn’t very babyish and most of my friends have children that are beyond the baby stage, so my thoughts had been along the lines of making a picnic throw or a lap quilt for a senior. But neither of those ideas feels quite right. The only thing that crosses my mind at this stage is that maybe it could be used as a bed footer – the drape hotels put at the base of their beds to prevent guests making dirty foot marks on the bed covers. I really don’t know. The other option is just to list it on eBay and see whether someone else can find a beauty in this quilt top that I am unable to see. eBay is looking like at strong contender to me at this stage. My order from ThumpaCat Fabrics in the South Island of New Zealand arrived last night. Check out their cute label. I love the bright colours and the apple shape. The delivery was speedy and I didn’t have to pay for postage on this order. Have to be happy about that. I’ve been researching what I might do with my charm squares and found a couple of ideas and resources. MinnesotaCharms.com has a nice little table to let you quickly see what size you can make with different numbers of charm squares. It’s hard to read the table on the page but if you open the Charm Math table in a new window and then zoom in on that it becomes readable. Missouri Quilt Star Company has an inspirational video on making a Snowball Cham Quilt on their quilters forum. It would be nice if they also posted a still picture of the finished quilt, but you can always pause the video or watch it a few times over, as I did. I really like the snowball look as they’ve done it so this is now looking like it might win over my original hourglass idea. Bought my first Charm Pack – Now What? I had an impulsive morning on the internet on Saturday. 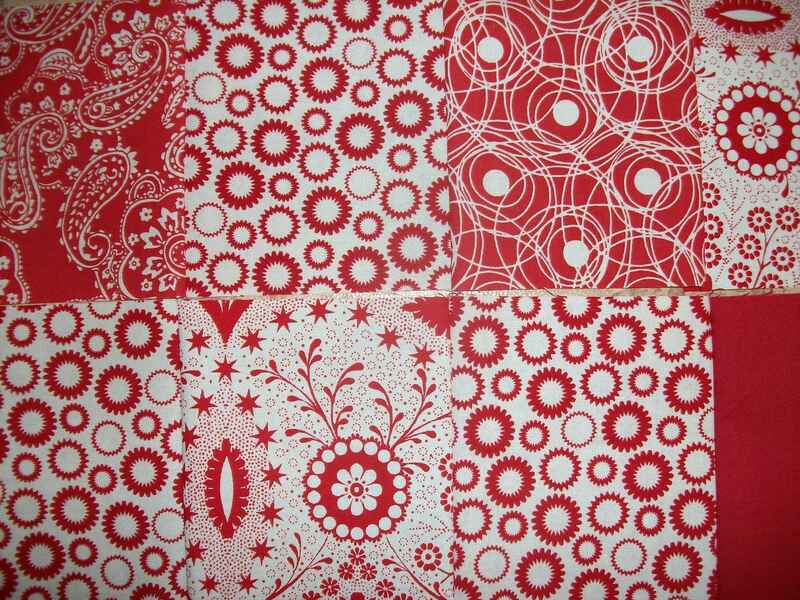 I decided to check out a new (or new to me) online fabric store in New Zealand called Thumpacat Fabrics. Strange name and their prices are quoted by the half yard, which is a bit of a trap for young players. It caught me by surprise, anyway. From here in Australia, New Zealand is just ‘across the ditch’ and the exchange rate is favourable if you have Australian dollars to spend. I stumbled across something I liked on their sale page. I bought two packs of Moda Wildflowers Serenade on sale, on a complete whim. I liked the ‘grown-up’ autumnal tones and pre-cut squares are something new to me. 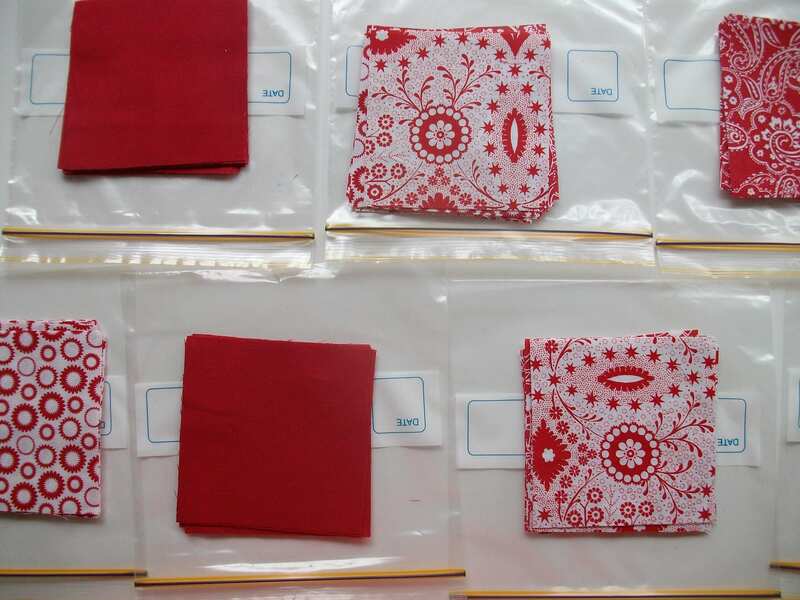 I have absolutely no idea what I’m going to do when 80 squares of 5 inch (13cm) fabric turn up. 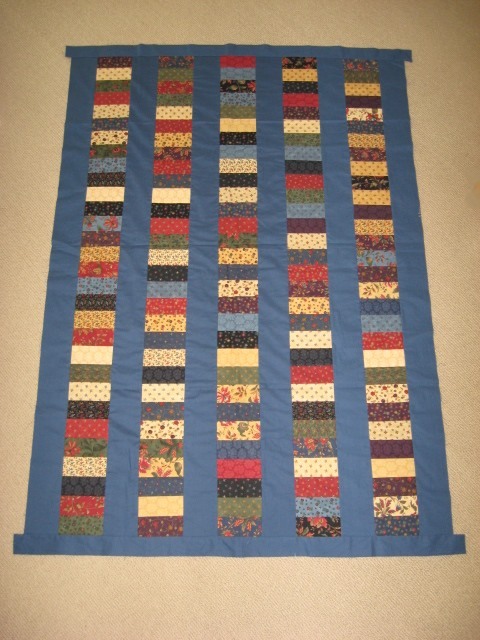 I posted a query on Quilting Board but haven’t had many suggestions at this stage, other than to go to the Moda Bakeshop and look for something there. At this stage I’m thinking hourglasses.